From transforming finished plans into a true dream home to putting together a design and building team from scratch, Farnsworth Builders does it all. Architect : Guban Architecture, Inc. In the wake of the Woolsey Fire, hundreds of Malibu-ites have suddenly found themselves thrust into a complicated building or rebuilding process they never wanted to be in in the first place. When the flames hit on November 9, reconstruction wasn’t even on the horizon for many. However in the blink of an eye, hundreds are now facing the hours of research, never-ending decisions and perpetual anxiety which too often accompanies the design and construction of a home. From deciding upon an architectural style, researching and finding the perfect designer, finding a trust-worthy and talented contractor, and ultimately ensuring their project remains on-schedule and on-budget, building a home is often one of the most stressful projects a family can take on. Farnsworth Builders, an industry leader in custom luxury homes for more than two decades, is keenly aware of this fact. As a result, the building firm is dedicated to making the entire building and design process as unbelievably seamless as possible for its clients, and indeed has amassed a reputation for doing so. This trademark ease is by design.Whereas most builders’ expertise and focus lies mainly in a project’s construction phase, Farnsworth Builders can expertly manage all the details of a project from its conception. Already have plans for your dream house or a remodel, and looking for a builder to complete it on-time, on-budget, with some of the best craftsmanship in the industry, for not an obscene amount of money? Farnsworth Builders can do that. But what if you don’t have plans, or even an architect, or, for that matter, the time necessary to find the perfect one? Farnsworth Builders can do all that too. Indeed managing these tasks is something of a specialty for the firm. Come to Farnsworth with just a notion of what you’d like your home to look like and their team will find esteemed local architects in the area with a specialty in your preferred design, many of whom they’ve worked with in the past and know personally. 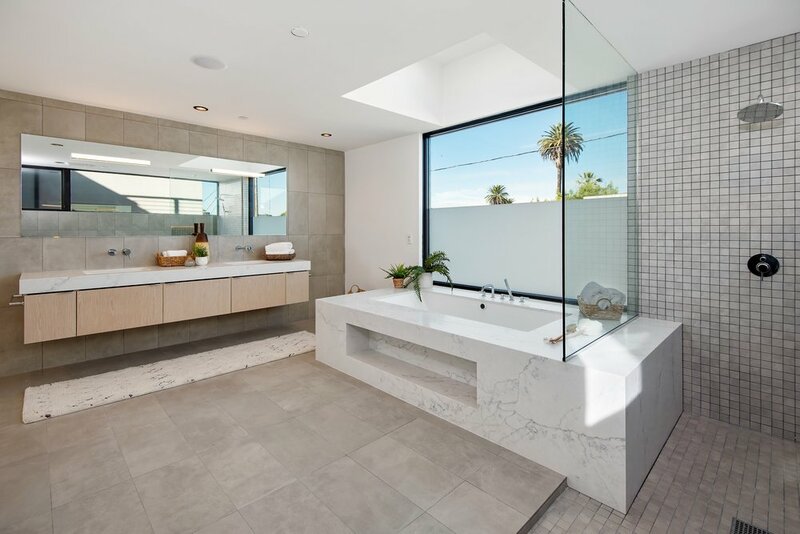 Above and below, a spectacular 2-floor modern home Farnsworth Builders recently completed on Venice’s ‘Architects Row’. And once plans have been finalized, Farnsworth Builders gets to work doing what it does best; turning plans on paper into a clients’ dream home. With a reputation for completing projects on-time, on-budget and with true care and craftsmanship, Farnsworth Builders has amassed consistently rave review and innumerable happy customers over the past two decades. A deeply-experienced, reliable and talented crew is just one of the trademarks of a Farnsworth Builders project. Past clients also consistently highlight the firm’s truly superior craftsmanship, from small design details beautifully executed to ensuring the foundational bones of a project are perfect.